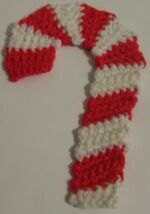 a crochet candy cane that actually comes out looking like a proper candy cane. This is so great for decorating packages, hanging on the tree, or any other holiday dress-up you can think of! Half Treble Crochet ( htr ) - Yarn over twice and insert hook in the stitch indicated. Yarn over, draw through two loops. Yarn over, draw through last 3 loops. Ch 6. Skip 1st ch. Sc in next chain, hdc in next chain, hdc in next chain, dc in next chain. In the last chain, htr, leaving the last 3 loops on the hook. Switch to red yarn. Pull through all 3 loops. Ch 2, turn. Row 1 - Sc in each st across (5 sc). Ch 1, turn. Row 2 - Skip 1st st. Sc in next 3 sc. 2 sc in last sc (5 sc). Ch 1, turn. Row 3 - Sc in each sc across (5 sc). Ch 1, turn. Row 4 - Skip 1st st. Sc in next 4 sc. In last sc, leave 2 loops on hook. Switch to white yarn. Pull through both loops. Ch 1, turn. By completing Rows 1 thru 4, you have completed 1 straight section. Rows 5 thru 16 - Repeat Rows 1 thru 4, changing yarn color for each section (4 straight sections). NOTE: If you want a longer candy cane, you can add additional straight sections here. Row 1 - Ch 3, turn. Dc in 1st st, dc in next st, hdc in next st, sc in next 2 sts, sl st in last st. Ch 1, turn. Row 2 - Sl st in sl st. Sc in next st. Hdc in next st. Dc in next 2 sts. 2 dc in last st, leaving 2 loops on hook. Switch yarn color. Pull through both loops. Ch 3, turn. This completes 1 curve section. Rows 3 thru 12 - Repeat Rows 1 and 2, changing yarn for each section, 5 times. On the very last row, end with ch 1, turn (6 curve sections). Row 1 - Sc in each st across (6 sc). Ch 1, turn. Rows 2 thru 3 - Repeat Row 1. Row 4 - Sc in each st across (6 sc).